Tropical Storm Harvey's center of circulation did not move much during the day on Sunday, Aug. 27 and NASA's infrared data identified powerful storms within Harvey that had the capability to produce heavy rain. NASA's Aqua satellite passed over Tropical Storm Harvey on Aug. 27 at 3:47 a.m. EDT (0747 UTC) gathering temperature data in infrared light. 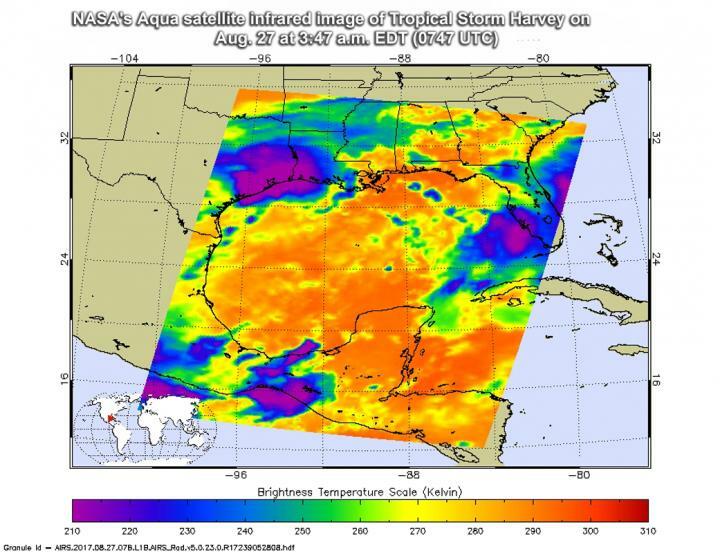 The Atmospheric Infrared Sounder or AIRS instrument aboard NASA's Aqua satellite provided temperature data on Harvey's storm tops. That's important information to know when trying to understand how strong storms can be. The higher the cloud tops, the colder and the stronger they are. So infrared light as that gathered by the AIRS instrument can identify the strongest storms within a tropical cyclone. AIRS detected strongest storms around the center of circulation and in a large area east of the center where cloud top temperatures were as cold as minus 63 degrees Fahrenheit (minus 53 degrees Celsius). Storms with cloud top temperatures that cold have the capability to produce heavy rainfall. The imagery showed those areas extended from southeastern Texas into southeastern Louisiana. NOAA's National Hurricane Center said at 7 p.m. CDT (8 p.m. EDT/2100 UTC), the center of Tropical Storm Harvey moved closer to Victoria, Texas. It was located by Doppler radar near latitude 28.9 North, longitude 96.8 West. That put's Harvey's center about 10 miles (15 km) northeast of Victoria, Texas. Harvey was moving to the southeast at 3 mph (6 kph). Maximum sustained winds were near 40 mph (65 kph) with higher gusts. The estimated minimum central pressure was 1,000 millibars. At 7 p.m. CDT (8 p.m. EDT) on Aug. 27 Tropical Storm Warning is in effect for Port O'Connor to Sargent, Texas. A Tropical Storm Watch is in effect from north of Sargent to San Luis Pass Texas. NOAA's National Hurricane Center noted "Catastrophic and life-threatening flooding continues in southeastern Texas, and flash flood emergencies are in effect for portions of this area. Please see warnings and other products issued by your local National Weather Service office for additional information on this life-threatening situation." Harvey is expected to produce additional rainfall accumulations of 15 to 25 inches through Friday over the upper Texas coast and into southwestern Louisiana. Isolated storm totals may reach 50 inches over the upper Texas coast, including the Houston/ Galveston metropolitan area. These rains are currently producing catastrophic and life-threatening flooding, and flash flood emergencies are in effect for portions of southeastern Texas. Elsewhere, Harvey is expected to produce total rain accumulations of 5 to 15 inches farther south into the middle Texas coast, farther west toward the Texas Hill Country, and farther east across south-central Louisiana.